Meet the Mankato and Magic Smoke's Tim Servo at the Analogue Heaven Bay Area Gathering on September 9th in Oakland. Hear sound samples using the Mankato. See the Thomas Henry designs forum on Electro-Music.com. Check out Dave Brown's rev. 2 Mankato, a first class build. He's got excellent tips and photos. Nice work, Dave! Thanks for sharing. 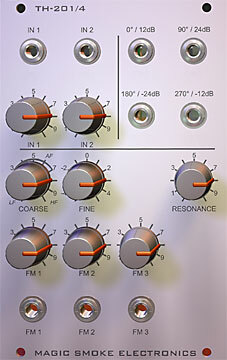 Designed by well known synth DIY guru Thomas Henry, the TH-201 is a low-pass VCF with some unusual operating modes. Magic Smoke will be producing printed circuit boards (PCBs) which can provide up to eight outputs. With the Resonance control turned all the way up, these filters will self-oscillate, operating as multi-phase LFOs or VCOs. Both DC-coupled and AC-coupled inputs are available. The DC-coupled inputs allow the TH-201 to operate as a voltage-controlled lag processor (slew limiter). All outputs are buffered and have standard 1k impedance. The Mankato covers a very wide frequency range -- around 0.005Hz (200 seconds/cycle) to beyond 20kHz without range switches. Changing the timing capacitors can provide extended low frequency operation. You can certainly build your Mankato with a range switch, if that's your preference. Isn't DIY great?! The PCB is available for do-it-yourselfers. 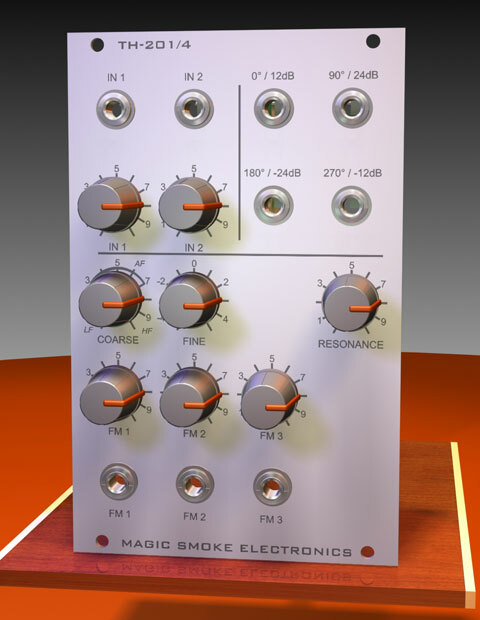 It is not difficult to build compared to other synthesizer modules, but Magic Smoke does not recommend this for your first DIY experience.  TH-201 Mankato Parts List for revision 3 PCBs. PDF file, 592K. TH-201 PCB (printed circuit board). 4" x 5" (102mm x 127mm), double-sided, with blue solder mask. Meets RoHS standards. Can be used to make /4, /8 or other configurations.  US or Canada: $3.50 for 1 or 2 PCBs, $5.50 for 3 or 4 PCBs.  UK, Europe, Australia: $4.50 for 1 or 2 PCBs, $6.50 for 3 or 4 PCBs. Revision 3 boards are in-stock and shipping. Send your PayPal payment to magsmoke@gmail.com. Please contact us to pay by check or money order. stg/soundlabs offers front panels and finished modules in Moog/Synthesizers.com, Frac, and MOTM formats; please check with STG for details. Subscribe to Smoke Signals and we'll keep you posted. We promise not to share your e-mail address with anyone else.